This article uses a consumer behavioural perspective to analyse the attractiveness of probiotic ice-creams, which straddles the ice cream category and the probiotic foods category. The article then goes on to deal with consumer attitudinal issues with regard to this new sub-category. Issues that emerge due to conflicting belief systems associated with the parent product categories as well as issues inherited from the parent categories are explored. The article finally presents a marketing strategy for the new sub-category using attitudinal concepts. Probiotic ice cream straddles the ice cream category and the probiotic foods category. Probiotic foods contain probiotic bacteria that help in digestion, improve the immune system and fight against allergic reactions. These are functional foods i.e. foods that have health benefits. Functional foods are a part of the larger wellness industry. This article analyses the probiotic ice-cream category, discusses issues pertaining to this sub-category and formulates a marketing strategy for them. To analyse the attractiveness of the probiotic ice-cream sub-category, it is essential to analyse the ice cream industry and the wellness industry from the perspective of consumer behaviour. The Indian ice-cream market comprises Gujarat Co-operative Milk Marketing Federation�s (GCMMF) Amul, HUL�s Kwality Walls, Mother Dairy, Baskin Robbins and a number of regional brands. Amul�s brand proposition is ice-creams made of natural milk at reasonable prices. Kwality Walls� proposition is ice-creams for pleasure and bonding. Baskin Robbins is positioned as offering high quality premium ice-creams with innumerable exotic flavours. 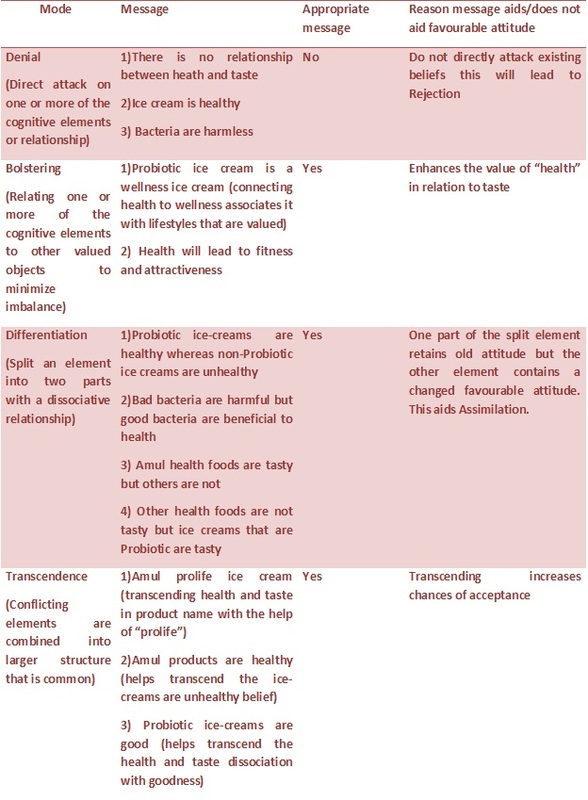 The attractiveness of probiotic ice-cream sub-category is established by comparison with standard ice-creams using the experiential marketing framework in Exhibit 2. Consumer involvement is higher in probiotic ice-creams and therefore variety seeking behaviour is lesser than that in standard ice-creams. Cognitive element assumes importance in the light of health benefits that increases consumer elaboration and involvement. The wellness industry is a sector of the health care industry that focuses on improving everyday health and state of well being, rather than curing illness. The wellness industry includes functional foods, alternative therapies, beauty, counselling, fitness and slimming and rejuvenation. The growth of the wellness industry in India reflects the evolution of consumer preferences and values of well educated Indians with disposable incomes. The values associated with the consumption of wellness products relate to health consciousness and being socially accepted/social recognition. The changing values are reflective of the increased awareness among consumers about fitness and health. This changing value system bodes well for the growth of the probiotic ice-cream category. Ego-defensive motivation is the primary attitudinal motivation for the consumption of many of the wellness products. Probiotics increase metabolism and will therefore be less fattening. Thus ego �defensive motivational consumption of probiotics will increase in future, mirroring the growth of other segments of the wellness industry. Issues that are unique to the new sub-category (conflicting belief systems, categorisation) as well as the issues inherited from the probiotics category (attitude creation needed, perception that health foods are expensive, lack of trust in health claims) as well as issues inherited from ice-cream industry (increasing health consciousness) are all explored. Since the crafting of the message is crucial, marketers examine how effective message can be crafted for Probiotic ice creams. Marketers find that the beliefs are psychologically inconsistent or imbalanced i.e. a valued element is associatively linked to a non-valued element. For e.g. ice-cream (valued) is linked associatively to not healthy (not valued). The modes of resolution of this imbalance (Abelson, 1959)2 are used in Exhibit 4 in order to craft an appropriate message. Probiotic ice-cream shares features with the category of Probiotic foods and the category of ice-creams therefore categorisation is an issue. The product is discrepant from ice-creams that are believed to be unhealthy; therefore, this is not just an addition of an attribute to the product category of ice-creams. Since the product is discrepant from the category a new niche sub-category will be created. The first category label that is provided will influence its categorisation. Consumers' expectations of a new product's performance will be determined by the performance of products in the category into which the new product is categorised (Moreau et al, 2001)3. Consumer�s evaluation of the product will be influenced by her expectations and thereby determine the consumer�s attitude towards the product. When the product is categorised as an ice-cream the performance expectations of the product and attitude will be based primarily on attributes like taste that are important to ice-creams. Though the functional food industry is growing, consumer awareness of probiotic foods is low and therefore attitudes with regard to probiotic foods are yet to be created. Attitudes with regard to probiotic ice-cream will be even more challenging to create. The conflict of attitudes arising out of the above belief can be resolved through differentiation by splitting healthy and non-healthy ice-creams. The perceived higher price of probiotic ice-creams can then be justified with the higher value associated with health foods. Probiotics not only develop healthy immune systems but also help prevent colon cancer and enhance brain activity. However, it is not necessary that what is true is believed (Poffenberger, 1923)4. The message must not conflict too sharply with the consumer's experience. The claim that eating ice-cream will prevent colon cancer and activate the brain will be too startling to be believed. They will be rejected by consumers as exaggerated claims. It is sufficient to communicate that Probiotic bacteria build immunity. Complicated and long health claims may also cause consumers to be more sceptical about the claims being made (Walker et al, 2009)5. As a result, it is important to keep the communication simple. People value fitness and health and are increasingly adopting healthy lifestyles. This changing value poses a challenge to the ice-cream brands. Health consciousness will affect the probiotics ice-cream sub category notwithstanding the probiotics label. As Probiotic ice-creams are functional foods whose consumption depends on healthy eating intentions, an attitudinal model that accurately predicts healthy eating intentions is needed to determine a strategy for the product. The theory of planned behaviour (TPB) accurately predicts the healthy eating intentions and behaviour (Corner et al, 2002)6. In TPB, the purchase and intention to buy a product is affected by three variables - attitude, subjective norms as well as perceived behavioural control (PBC). PBC is the perception of the extent to which performance of the behaviour is within one�s control or is easy�difficult. Probiotic ice-creams should be categorised as a niche sub-category under ice-creams. This category label is recommended as the PBC of eating ice-creams is much more as opposed to Probiotic foods. Ice-creams are viewed as an indulgence and therefore, the behaviour of consuming an ice-cream is easy and within one�s control. The outcome beliefs of probiotic ice-creams will be evaluated positively by health conscious consumers. Therefore the target segment for the product is the educated health conscious urban family. Probiotic ice creams should view the entire family as the target segment because subjective norms determine eating intention and normative beliefs are commonly the same within families. Educated consumers are the target segment because their need for cognition (NC) is high. When exposed to a new product people with high need for cognition develop attitudes that exhibit greater persistence over time and greater resistance to change in comparison to those with lower NC (Petty et al, 1992)7. This is especially important in the light of the variety seeking behaviour followed by ice-cream consumers. The product must be perceived as having high PBC and can therefore be positioned as offering hedonic benefits. This positioning as a wellness indulgence product will also ensure that there is affect-cognitive consistency which will aid the creation of a favourable attitude towards the product. The wellness aspect will serve to bolster the health element of the product through association with the wellness industry that includes the fitness and the rejuvenation industry which is valued positively by our target segment. Health conscious mothers should be sold on the proposition that children will willingly eat these wellness ice-creams and build immunity. The product must not only be made available in family packs but also in smaller packs which will increase product trial which in turn will lead to favourable attitude creation, due to positive reinforcement. The product can be priced at a small premium as the conflict of attitudes arising out of this premium can be resolved through differentiation, by associating the premium with health benefits. People strive to achieve equilibrium between maximizing pleasure and minimizing harm. The cognitive strategy people employ to reach this equilibrium is the activation of Compensatory Health Beliefs (CHBs). CHBs are beliefs that the negative effects of an unhealthy behaviour can be compensated for, by engaging in another, healthy behaviour (Rabiau, 2006)8. This cognitive strategy can be used to our advantage in the message communication for probiotic ice-creams as these ice-creams achieve equilibrium between maximizing pleasure and minimizing harm. The product can be promoted as an ideal compensatory product between health and indulgence. In order to ensure that this sub-category does not fail, marketers need to ensure that it is taken into the �consideration set�. Attitude influences consideration and choice. In addition it has been found that attitude strength will moderate the influence of attitudes on consideration, in addition to choice (Priester et al, 2004)9. Therefore marketers not only need to ensure the creation of favourable attitude but also increase its strength. Attitudinal strength can be increased by increasing elaboration, by increasing antecedents of elaboration (like self relevance) and by highlighting consequences. Therefore in order to ensure that probiotic ice-cream is taken into the consideration set, marketers need to increase attitude strength through wellness awareness (elaboration) and highlighting health benefits (consequences). Marketers also need to communicate to health conscious consumers that probiotics are self relevant, given their health consciousness. This self-relevance will result in greater elaboration and consequently increase attitudinal strength. Greater elaboration will also reduce variety seeking behaviour. Attitude towards brand is especially important in the light of the variety seeking behaviour followed by ice-cream consumers. Marketers should ensure that the sub-category is synonymous with brand. Marketers should build strong associations between the sub-category and brand name. Due to its categorisation, probiotic ice-creams will be evaluated on the basis of taste. Thus, the use of a brand name with positive evaluations of taste will help in resolving conflicting beliefs regarding the taste of health foods. Attitude towards probiotic ice-creams is influenced by the value of health consciousness. Attitude strength and attitude centrality moderates the relationship between values and attitudes (Honkanen et al, 2004)10. Attitude strength can be increased as discussed earlier. Probiotic ice-cream relates to the Rokeach terminal value Security (family, personal) as health consciousness is associated with this terminal value. Probiotic ice-cream also links to the terminal value of pleasure. These values are more likely to significantly influence attitudes when the relevant value is activated and the link between the activated value and attitude is activated as well (Dreezens et al, 2008). Therefore, in probiotic ice-cream�s communication, the link to family security can be activated by specifying how the product develops the immunity system and keeps the family safe from diseases. The link of the product to health consciousness will also be activated in the process. Probiotic ice-creams are attractive because they reduce variety seeking behaviour through higher involvement due to health benefits. They are also attractive in the light of changing consumer values. Issues relating to the conflicting beliefs of the parent categories as well as other issues can be resolved through appropriate message crating. Probiotic products must be positioned as a wellness indulgence product to ensure high PBC. Product communication must leverage compensatory health beliefs to position probiotic ice creams. 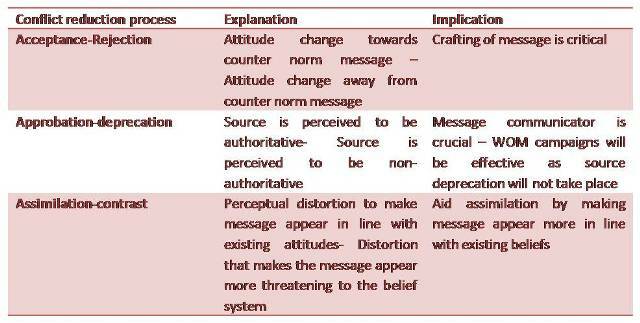 Sub-category development must be facilitated by increasing attitude strength through elaboration. Attitude towards brand must be developed in step with sub category development. The link to relevant values must be activated to influence consumer attitude.